Gemini Arabians sailed through into the next round of the Masters Champions League after they made it five wins out of five after beating Virgo Super Kings by 22 runs. Arabians set a modest total of 145 to chase, but a brilliant bowling display meant that proved to be too much for the Super Kings. After winning the toss and choosing to the bat, the much changed Arabians decided to open with Jacques Rudolph and Kumar Sangakkara. But that didn’t go according to plan as Rudolph struggled and fell early. Saqib Ali came in at No.3 as Sehwag decided to give the other batsman a chance. 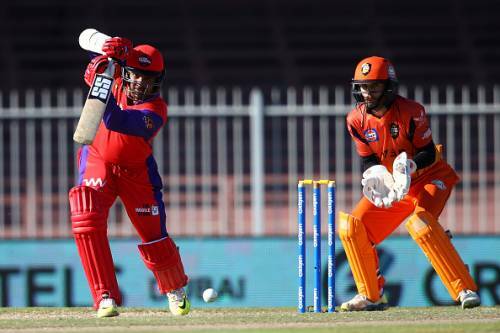 Sangakkara, who has been in sublime form in the MCL, continued his golden touch as he notched up his fourth fifty in five games. Although he got out soon afterwards, Saqib continued on from where the Sri Lankan left off. Unfortunately for the Arabians, he didn’t find a willing companion. And those he did couldn’t hit the big shots. Saqib himself tried his best to increase the tempo of the game, but in vain as struggled to get to grips with a tricky surface. In the end, it took a very good effort from the Arabians for them to get to 144. The Super Kings spinners’ did well to restrict the flow of runs and didn’t give much away and ensured they didn’t have a huge target to chase, like the previous two sides, who faced the Arabians did. Unfortunately for the Super Kings, they lost their captain off the second ball and by the end of the powerplay, not only had they lost two wickets, but also failed to take advantage of the powerplay and get off to a good start. Neil McKenzie did well to hold things together from one end, but as he couldn’t find the boundary at will, it put further pressure on the other batsmen, who simply couldn’t stay at the crease for long enough to create much of a dent in the run-chase. When McKenzie and Hasan Raza departed in quick succession, the game was all but over. But Jacob Oram and James Foster did their best to ensure that the game didn’t go away in a flash. But that didn't help matters too much as the fours they hit were simply too little too late as they lost by 22 runs. Brief score: Gemini Arabians 144/5 in 20 overs (Sangakkara 51; Bandara 2/26) beat Virgo Super Kings 122/6 in 20 overs (McKenzie 46; Mills 2/40) by 22 runs.